A Siberian unicorn roamed the Earth with the humans until at least 39,000 years ago. Scientists believe that the first modern humans, or homo sapiens, were present around 200,000 to 300,000 years ago. 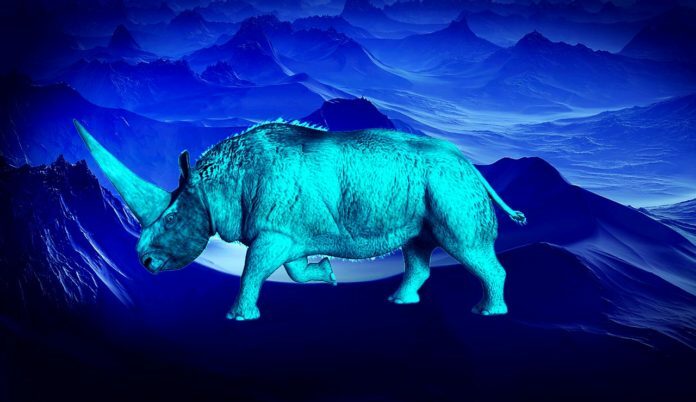 While researchers previously believed that the Siberian unicorn died off around 200,000 years ago, new evidence emerges that, according to DNA analysis, the mysterious creature actually lived until 36,000 years ago. It is possible that, with DNA, genetic engineers can recreate this species today. Just like Chinese scientists were able to genetically engineer super-strong dogs, scientists should also be able to genetically engineer a Siberian unicorn to a smaller size… to the size of your dog. No wonder why we have all those stories of unicorns. The Siberian unicorn might have existed alongside humans; or, something might have existed that looked like a unicorn to ancient humans. These species had a long horn and ate grass. While the ancient creature vaguely resembles a modern-day rhino, it is not closely related. Weighing four tonnes, the animal had a huge head with a horn that was up to 1 meter in length. From the rhino ancestral line, it split off from modern-day rhinos over 40,000,000 years ago. Just as rhinos are picky about their habitat, scientists believe that the Siberian unicorns might also have been very picky about where they lived and what they ate. Because this ancient grass-eater was selective with its diet, it might have died off from grass shrinkage and lack of adequate food. The extinction might have occurred when the Earth warmed at the end of the last Ice Age, scientists say. Genetic engineers were able to analyze the DNA. Now, take the DNA, and they might possibly be able to recreate the Siberian Unicorn. Even now, some gene engineers want to recreate the dinosaur, by retro-engineering the DNA of birds. Given the way Chinese genetic engineers seem to be experimenting these days, they might fancy creating a Siberian unicorn pet that is the size of your dog. Whether or not the DNA question is ethical, humankind is constantly pushing for progress. Thus, scientists have been trying to push all kinds of boundaries since the beginning of scientific discoveries. Were it not for lab experimentation with animals, how can we get the cosmetic products that we get today? In any case, we digress. A Siberian unicorn that is dog-sized might be a cute pet to have, if you have enough grass to feed it.